SAILING is the propulsion of a vehicle and the control of its movement with large (usually fabric) foils called sails. By changing the rigging, rudder, and sometimes the keel or centreboard, a sailor manages the force of the wind on the sails in order to move the vessel relative to its surrounding medium (typically water, but also land and ice) and change its direction and speed. Mastery of the skill requires experience in varying wind and sea conditions, as well as knowledge concerning sailboats themselves and an understanding of one's surroundings. Yacht racing is a form of sport reserved for yachts and larger sailboats. Yacht racing usually refers to sailboat racing in a variety of forms with large racing yachts; distinguished from dinghy racing. 30 greatest sailing escapes to experience in your lifetime - The Telegraph. International Sailing Federation | ISAF - since 1907. Recognized by the International Olympic Committee as the world governing body for the sport of sailing yacht racing. Jim Ratcliffe: Britain's richest man plots America's Cup coup - "He's investing $141 million in a British America's Cup venture headed up by legendary sailor Ben Ainslie, but billionaire Jim Ratcliffe is still discovering things about his Ineos team skipper." Louis Vuitton Cup - (2004-2013). Yachting competition connected with the America's Cup. 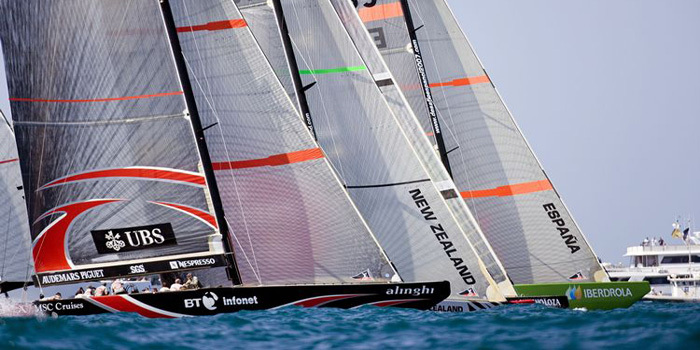 Performance Handicap Racing Fleet - handicapping system used for yacht racing in North America. It allows dissimilar classes of sailboats to be raced against each other. Portsmouth Yardstick - system of handicapping used primarily in small-boat yacht racing. The Secrets of the Wave Pilots - The New York Times. The Water Sporter - "Site dedicated to all things water sports. As well as product reviews and news, we have how-to guides, tutorials and much more here on the site, which is growing by the day." What next for the America's Cup? - Sir Russell Coutts on making the pastime of titans an accessible attraction. Why Britain's richest man Jim Ratcliffe has invested $153M in sailing - CNN sport. World's best sailing destinations - in pictures - CNN travel. Yachting paradise: Sardinia's Maxi Yacht Rolex Cup - CNN. yachts of America’s Cup are faster & weirder than ever - "Thanks to science (and a lot of money)." Cigarette Racing - since 1969. Les Voiles de Saint-Tropez - regatta that takes place once a year in the gulf of Saint-Tropez since 1981.